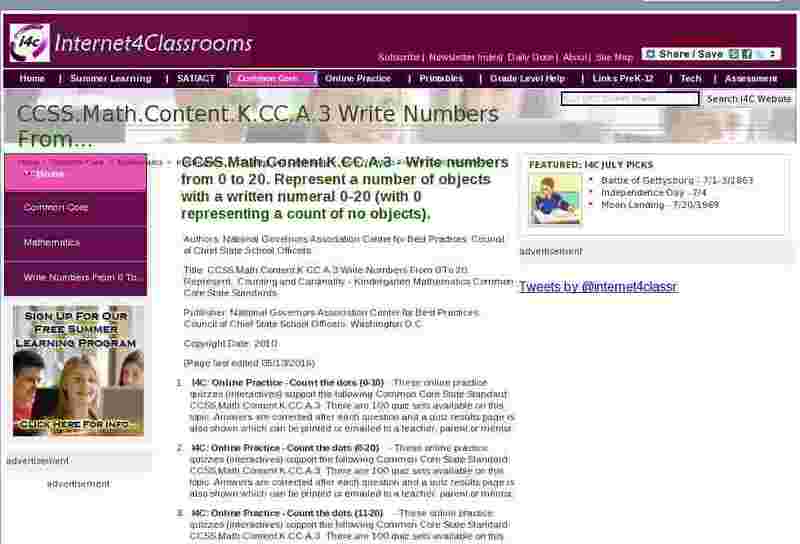 CCSS.Math.Content.K.CC.A.3 - Write numbers from 0 to 20. Represent a number of objects with a written numeral 0-20 (with 0 representing a count of no objects). I4C: Online Practice - Count the dots (0-10) - These online practice quizzes (interactives) support the following Common Core State Standard: CCSS.Math.Content.K.CC.A.3. There are 100 quiz sets available on this topic. Answers are corrected after each question and a quiz results page is also shown which can be printed or emailed to a teacher, parent or mentor. I4C: Online Practice - Count the dots (0-20) - These online practice quizzes (interactives) support the following Common Core State Standard: CCSS.Math.Content.K.CC.A.3. There are 100 quiz sets available on this topic. Answers are corrected after each question and a quiz results page is also shown which can be printed or emailed to a teacher, parent or mentor. I4C: Online Practice - Count the dots (11-20) - These online practice quizzes (interactives) support the following Common Core State Standard: CCSS.Math.Content.K.CC.A.3. There are 100 quiz sets available on this topic. Answers are corrected after each question and a quiz results page is also shown which can be printed or emailed to a teacher, parent or mentor. I4C: Printable Worksheets - Count the dots (0-10) - These worksheets support the following Common Core State Standard: CCSS.Math.Content.K.CC.A.3. There are 100 worksheets available on this topic. A master answer key is available. I4C: Printable Worksheets - Count the dots (0-20) - These worksheets support the following Common Core State Standard: CCSS.Math.Content.K.CC.A.3. There are 100 worksheets available on this topic. A master answer key is available. I4C: Printable Worksheets - Count the dots (11-20) - These worksheets support the following Common Core State Standard: CCSS.Math.Content.K.CC.A.3. There are 100 worksheets available on this topic. A master answer key is available. Counting Dots - Count the dots and write the correct number. Counting Game - Count the objects in the picture and write down the number that represents that amount. Counting Shapes up to 20 - Count and type in the correct number. Counting up to 20 - Counting objects up to 20. Count and type the correct number. Dice Race - Center Activity; directions on handout. Math Center Ideas - Center Activity; directions and materials. Pirate Numbers - Count the barrels in the water and write the number in the blank. Click the red button to see if you are correct.